What Color Should I Paint My Brick Fireplace? When choosing a paint color for your brick, it’s easy to get overwhelmed with choices. Choosing the right color reflects your personal style and your room’s personality. Think of the mood you want to project. Whether you want to create a tranquil sanctuary or make a dramatic statement, paint colors can make all the difference in the look and feel you’re trying to create. Ask yourself, “Do I want my fireplace to stand out or blend in with the room?” The color paint you choose will determine how much your fireplace becomes the focal point in your room. Dark colors will draw attention and create drama. If you want your fireplace to be the focal point in the room, a pop of color will draw attention to that area of your room. Shades of white and off-white create a calm neutral look. Tan, beige, cream and light gray blend in for a natural look. Soft shades of black and gray work well with contemporary style rooms. Whitewashing, painting a solid light neutral color, or using a product such as Brick-Anew to create a “real brick” look will blend in with any decor. 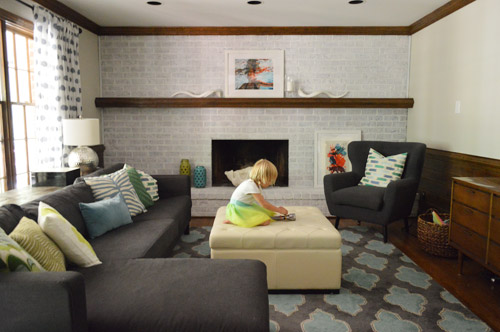 Painting the fireplace brick a darker color with light colored walls can create an interesting contrast. You can also create a contrast by painting the brick and the mantel different shades. For example, a white painted brick with a black mantel makes a bold statement. If you want the fireplace to blend in completely with the room, try painting the walls and the fireplace brick the same or similar colors. Soft, light shades create a calm, serene atmosphere in the room and downplay the fireplace as the focal point in the room.